56 pin TSSOP and 24 pin SOIC pads on 1 side with Proto-Chip pads for discretes. 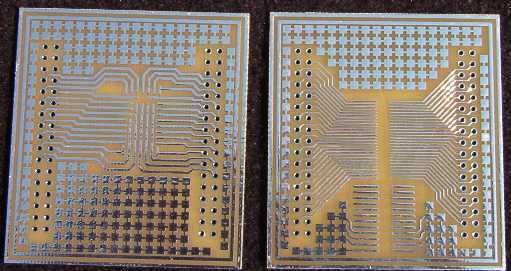 Rectangular PLCC from 8 to 32 pins, on back side. Will fit some small Square PLCC's also. Has Proto-Chip pads on this side also. The leads go to a 34 pin ribbon header connector on each side (2 connectors) with some pins open for wiring other signals on/off the board, or to the Proto-Chip pads. The board is made of FR-4, 0.062" thick, size is 2.05" x 2.25". 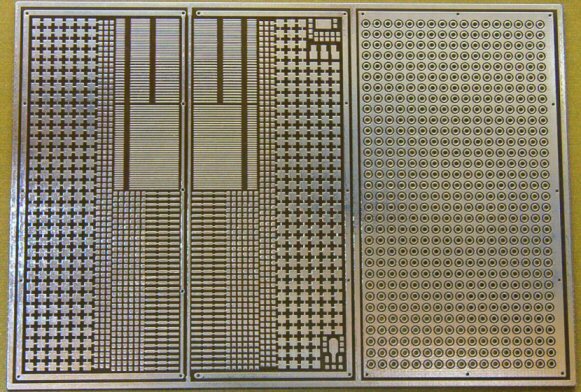 TSSOP traces are 0.012"/0.3 mm and pitch is 0.025"/0.65 mm. An SOIC can fit on every other trace in TSSOP area! Or IC DIP SOCKETS! The SOIC area is 24 pins, with 8 of the pins going to the Proto-Chip pads. The PLCC side is 0.025" tracks/pitch. This side is user configurable, by cutting out the tracks to fit your Rectangular/Square PLCC - LCC from 8 to 32 pins. This board can be used for one or the other, possibly both, depending how you configure the PLCC side and the size of PLCC, and use a SOIC with discrete parts on both sides! Trying to make a difference with your imagination and prototyping skills. Cut up the board to make smaller boards to fit your rework, or enclosure. SUMMER Sale! NO QTY. Discounts!